What do whales do for the other 16 hours a day, Dr. Buesseler? Stop the smoke and mirrors! Educational comments posted with the article as well. KGMB, Jan 17, 2017 (emphasis added): Officials investigate record number of humpback whale deaths… Six humpback whale carcasses have washed up onto Hawaii shores since November. That’s double the number typically found in a season, which runs from November to May… The previous record [of five] whale carcasses found in Hawaii waters was in 2013… Biologists aren’t sure what’s behind the increase in deaths. “It is higher than usual. It’s almost double this early in the season for what we’d get in a whole season,” said [NOAA’s] David Schofield… Since November, whale carcasses have been scattered throughout the main Hawaiian islands… Biologists are investigating to see if the whales starved or if there’s a problem with the ocean’s health… officials will be meeting with partners in Alaska and Washington D.C. to investigate further. KHON, Nov 22, 2016: Beached melon-headed whale euthanized on Maui… “The body condition was significantly compromised…” said [NOAA’s] Aliza Milette-Winfree… a necropsy will be done to determine what made it sick. AP, Aug 26, 2016: Experts are reporting the sighting of a sickly humpback whale off Maui. [NOAA’s] Malia Chow said Friday the animal is emaciated and covered in whale lice… She says the animal’s poor condition is a mystery. How about in 2017? — The Garden Island, Jan 30, 2017: Annual whale count… [Jean Souza, HINMS Kauai programs coordinator] said the Kauai sites… saw an average of four whale viewings within a 15-minute time count period… down from the six sightings of the 2016 count. Researchers are trying to determine what caused the deaths of three large whales found along Alaska’s coastline within a single week in late June, and whether the fatal strandings might be related to a big spike in whale deaths in the region last year. A fin whale died in Knik Arm near Anchorage on June 22. Four days later, a humpback was found dead off Point Carolus in Glacier Bay National Park. Two days after that, another humpback was found in Turnagain Arm near Hope. Investigators with the National Oceanic and Atmospheric Administration and partner groups have taken tissue samples from all three whales. The Glacier Bay humpback, which had been observed by scientists since the late 1960s and was nicknamed “Festus,” may provide the most clues, because researchers were able to conduct a full necropsy. British Columbia veterinary pathologist Steven Raverty led the postmortem, and said there was no evidence of skull or other bone fractures, but there were indications the whale wasn’t healthy. In addition, he said, the whale had diminished fat reserves, which may mean it wasn’t consuming enough food. NOAA officials don’t know if these recent deaths are related to the dozens of whale deaths in the Gulf of Alaska last year. 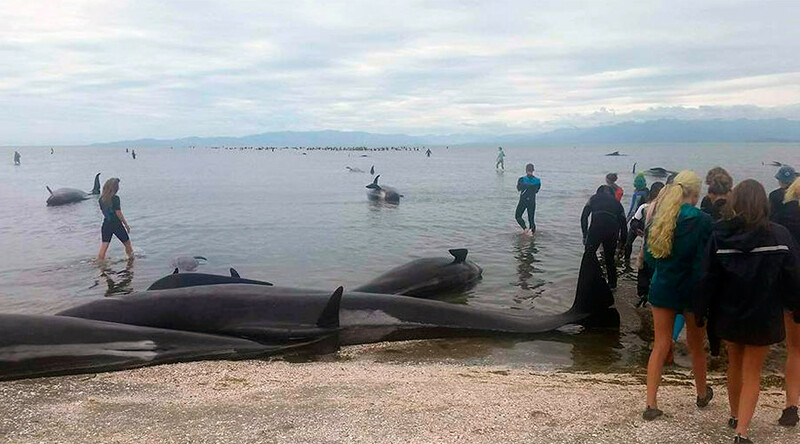 Those 2015 strandings were labeled an “unusual mortality event,” and the cause is still under investigation. It could be a difficult mystery to solve, because so many of the carcasses were too decomposed or too remote to study. Raverty said the recent whale deaths could help researchers to better understand last year’s die-off. “We look at these individuals that are now stranding in 2016 as a really unique opportunity to try and establish baseline health and understanding, whether there may be evidence of ship strike, infectious disease, exposure to harmful algal blooms, and these will all be put in the context of what had occurred historically, but also during the unusual mortality event,” he said. Tissue samples from all three whales have been sent to labs for analysis, but it’s not clear when researchers will know more about how and why they died. What happens when the food runs out everywhere? SAN FRANCISCO (AP) — Migrating humpback whales have been swimming into San Francisco Bay in unprecedented numbers during the past two weeks — an onslaught that experts say could be caused by an unusual concentration of anchovies near shore.